In this article, Vienna family dentist, Priti Naik, DDS will examine how diabetes affects teeth and gums. We’ll also discuss how individuals with diabetes can maintain their oral health more effectively. Diabetes is the result of the body’s failure to produce insulin, which helps regulate blood sugar. When the process of blood sugar regulation is interrupted, serious complications can occur, such as damage to the heart, liver, kidneys, and other organs—including the mouth. Here are a few ways that diabetes can affect your oral health. Tooth Decay and Tooth Loss – Diabetes can lead to a high glucose level in your saliva. The bacteria in your mouth thrive on glucose, which can lead to advanced stages of tooth decay and an increased risk of tooth loss. 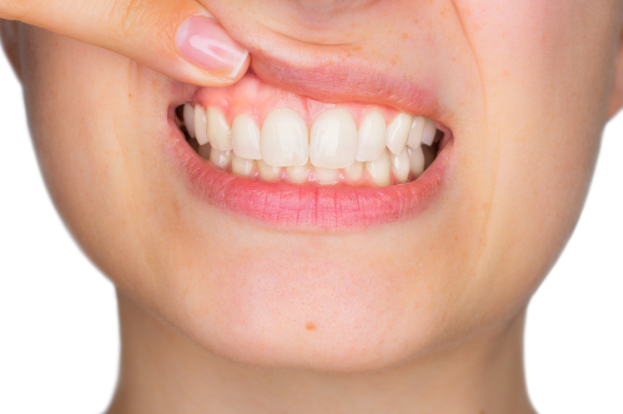 Periodontal Disease (Gum Disease) – Periodontal disease occurs when bacteria infect the gums. The condition is exacerbated by high blood sugar levels, such as those found in diabetics. In mild cases, periodontal disease leads to increased sensitivity and bleeding. In severe cases, this can result in total tooth loss, infection of the jawbone, and a variety of other dangerous conditions, which will require invasive periodontal treatment. Dry Mouth – Individuals with diabetes often suffer from dry mouth. Proper levels of saliva help neutralize bacteria and wash away food particles. Because of this, reduced saliva buildup (xerostomia) can increase your risk of tooth decay and gum disease. Fungal Infection (Thrush) – Thrush is caused by the fungus candida albicans, which is naturally present in our mouths. However, the combination of high blood sugar and dry mouth can create an ideal breeding ground for thrush. This infection causes painful and sore red or white areas inside your mouth. Diabetes affects your teeth and gums in many ways. So, how can diabetic patients avoid these complications? If you are diabetic, don’t worry. With the proper steps, you can dramatically reduce your risk of gum disease and tooth decay and ensure that you maintain a healthy mouth. Here are some simple steps to help you do so. See Your Dentist Regularly – General dentistry services such as regular cleanings and examinations will be your best bet in combatting the effects of diabetes on your oral health. You should be seeing your dentist every three to six months so they can check your mouth for periodontal disease and tooth decay. A qualified dentist like Dr. Priti Naik can help you maintain a higher level of oral health. Maintain Good Oral Hygiene Habits – You should be brushing and flossing at least twice a day. A regular oral hygiene routine helps you destroy the bacteria that cause gum disease and tooth decay, even if you have elevated blood sugar levels. Control Your Blood Sugar Levels Closely – This is the most important action you can take. Follow your doctor’s orders to control your blood sugar levels, and do your best to maintain a healthy level. Doing so helps mitigate the effects that diabetes can have on your oral health. Diabetic? Need Oral Hygiene Advice? Come to Priti Naik, DDS! Whether you’re in Vienna, Tysons Corner, or McLean, the office of Priti Naik, DDS is the best choice for all of your oral care needs. Dr. Priti Naik has years of experience treating patients of all kinds, including those with diabetes. If you’re diabetic and concerned about your oral health, come in for an appointment today. At our comfortable, family-friendly facility, we can discuss your health condition, examine how it’s affecting your mouth, and devise a comprehensive treatment plan that will help you avoid tooth decay and periodontal disease. Don’t leave your oral health up to chance, especially if you’re diabetic. Contact us today for an appointment at (703) 288-1800, or come to our office at 8230 Boone Blvd #320, Vienna, VA, 22182.